What delights are you dreaming of? She also challenged us to collect our inspirations in different places and different ways. Immediately I thought of making a Pinterest board, but I am still hesitant and leery of this photo heavy, misgiven or omitted credit of work haven. I do look occasionally, but I didn't think I wanted my dreamboard to be just online. The tactile nature of touching, finding, cutting, positioning and pasting my board is still a useful practice for me. I did start a 'note' in Evernote - an online notebook of sorts. This helped me brainstorm in the moment lots of delights and I did paste some online photos here too, for my eyes only. But this was near the new moon. When the full moon arrived I had found some new print sources and not much time. I discovered my board looked and felt a lot darker than I thought DELIGHTS should look!!! I also found this great full size National Geographic photo of monarchs - a sight I have often thought would be an amazing delight. The woman - who is SHE? my husband asked - the woman is just a woman. Happy in her crochet poncho. She looks confident to me, dressed up and ready to go out and see some art, perhaps, or hang out at a cafe. She is smiling and I thought, briefly, about learning to crochet so I could make my own crochet poncho and look/feel like that! Eventually this board made deep sense to me. Two delights that I will be immersed in for the summer as my whole family will be home together, each wanting to find time and opportunity to explore their own interests. We are also talking about a 'retro Summer' - pushing back from electronic toys just a little bit. More DVDs and less netflix, perhaps. More books and puzzles and beaches and board games. Less screen time. The words wanted to be alone. together. on this board too. Each making their own meaning and then more as I read them one after another. 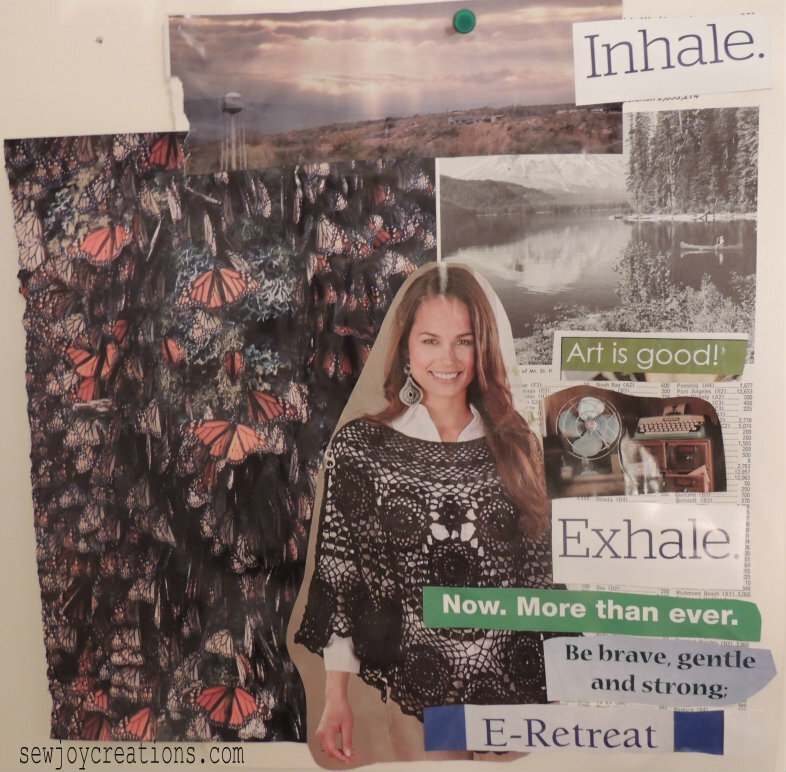 I am open to exploring "E- Retreat". Not sure if it is referring to retreating from electronics, or finding a group online to explore something together in depth. Alone. Together. More Strawberry Dreamboards to view and enjoy at Jamie's link up here.